Are you hoping to find the best essential oil diffuser of 2018? We’ve found five of the best diffusers on the market. In addition to introducing these diffusers, we’ll share with you what we’ve found out about how to choose the right diffuser and answer some commonly asked questions about these products. 1. What to Look for in an Essential Oil Diffuser? 2. How Do Diffusers Work? 3. What Is an Oil Diffuser? 4. How to Use Essential Oil Diffuser? 5. 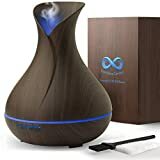 How to Clean Oil Diffusers? URPOWER 2nd Version Essential Oil Diffuser is a compact, ultrasonic diffuser that is ideal for use in small spaces. This updated version produces stronger mist than the previous version. 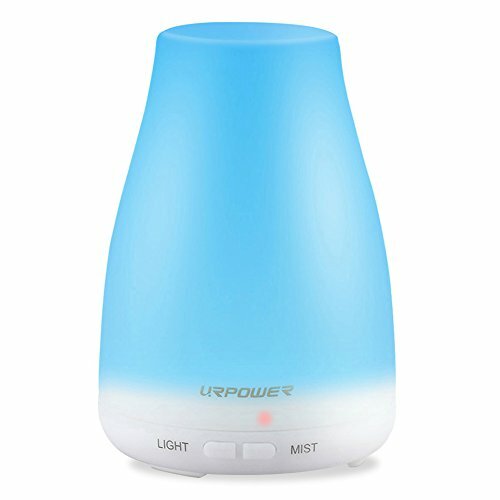 This ultrasonic essential oil diffuser made by URPOWER is a product made out of plastic. It holds a maximum of 100 milliliters of water and has some unique features that make it appealing to some consumers. This cool mist humidifying diffuser has seven color changing light modes, a nightlight, programmable cycles, and an auto-shut off that ensure it works efficiently but not dangerously while you are bringing both moisture and aroma into your room. The two diffusion settings on this model are handy. One of them diffuses continuously while the other will alternate between on and off for as long as there is water remaining in the diffuser. Each of these modes can run for four and six hours respectively, and many found that they run even longer. Another great benefit of using this model is that it is incredibly quiet. While some mist settings on other models will awaken light sleepers, this is not the case with this URPOWER model. It’s relatively easy to spill water while refilling the URPOWER 2nd Version Essential Oil Diffuser, which is a letdown. Also, because of how you have to twist the top on and off, you’ll find that there is a learning curve to refilling it without spilling. If you have a secure grip, you might be able to avoid this, but having a towel on hand is probably the better option. The InnoGear 2nd Version Aromatherapy Essential Oil Diffuser is another ultrasonic, cool mist humidifying diffuser that you can use in small to medium-sized rooms with good results. 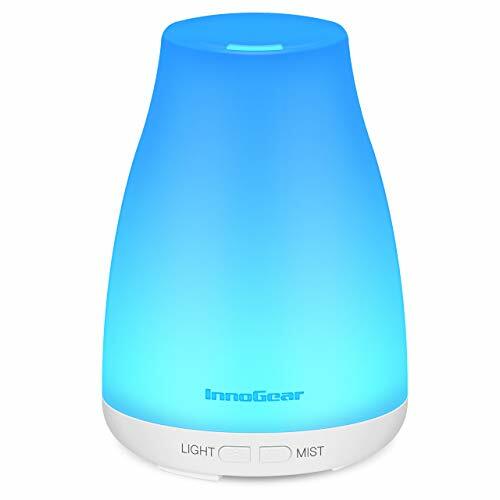 This is a cool mist humidifying oil diffuser that is made by InnoGear. Like the URPOWER model, this is a second edition product wherein many improvements were made since its initial release. This model has three different working modes as well as seven various light modes. The working modes include intermittent (30 seconds on, 30 seconds off), continuous, and lights only. You can expect it to work between seven and eleven hours, depending on what setting you are currently using. This is a portable, ultrasonic oil diffuser that can fill small and medium-sized spaces with a light scent to help you enjoy aromatherapy benefits. This is a super small and sleek diffuser, which is excellent for anyone who has a small apartment or simply wants to be able to tuck this product into a corner. Despite its small size, the light is very bright, and the mist has a right amount of dispersion around the room as it is very fine. Another great thing about this model is that it has a simple, easy-to-understand design. There are really no complicated instructions to follow, so you can use it easily and quickly. Many people have had issues with this model leaking and causing problems with the fan at the bottom. In most cases though, it turned out that they were not filling it up properly. Still, the manufacturer seems to be quick to remedy this type of issues. The cord can get in the way. 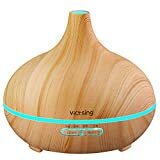 VicTsing Aromatherapy Essential Oil Diffuser is a unique diffuser with a very modern design. If you want something to fit in with your home decor, this is a great choice. 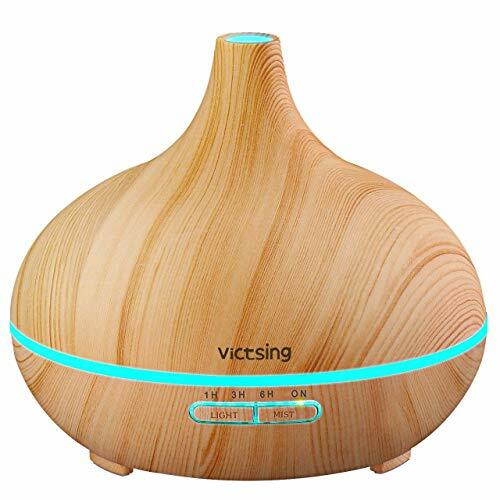 This essential oil diffuser from VicTsing can be ordered in one of the five different designs available. All of which are made to fit into your home decor. This diffuser model relies on ultrasonic power to diffuse the oil into the water before it is misted into your space, and it does so very effectively. The reservoir on this model has a 300-milliliter capacity, and the light can be displayed in seven different colors to add a bonus type of color soothing to your oil diffusing experience. One unique thing about this diffuser is that the lights can be set on a specific time independent of the oil diffusing. There are four different light settings namely one hour, three hours, six hours, and always on. This gives you a lot of unique choices in what you want to have running at any given time. The mist can also be alternated between a high and weak setting rather than an intermittent or continuous one. For those who prefer to control how much mist is released rather than how often, this is a great feature. While this diffuser has a larger water tank that can help it work better in slightly larger rooms, the mist nozzle direction cannot be adjusted. When you are using a diffuser in a large room, nozzle adjustment is essential, so this model is still better suited for small and medium-sized rooms. The ASAKUKI 5-in-1 Essential Oil Diffuser is a great ultrasonic humidifying diffuser that has a fun, modern design. You can alter light modes and trust that this model is safe to use. One of the standout facts about this diffuser is that it is made from eco-friendly PP plastic materials. This is actually the same material used in making many baby bottles, so you can be sure that it will not add any dangerous chemicals to the mist that is diffused into your rooms. The model is an ultrasonic type that uses a few different modes to disperse the oils effectively. You can alter the strength of the mist so that it puts out either more or less mist each time it is released. Additionally, the ASAKUKI 5-in-1 Essential Oil Diffuser is very easy to adjust. 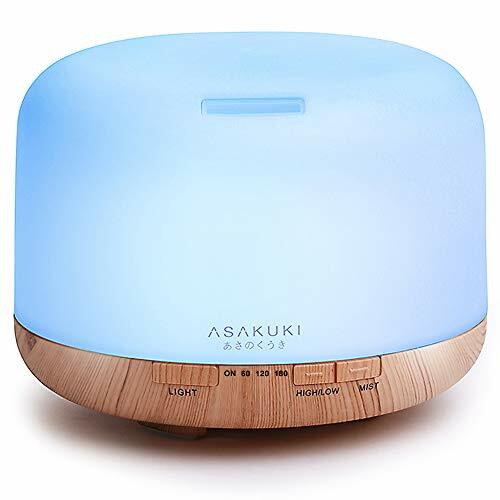 One great thing about the ASAKUKI 5-in-1 Essential Oil Diffuser is that even though it has a bright LED light option available in many colors, you can actually display that color in a “dimmer” mode. For those who often find diffuser lights to be too bright, this is a great modification. Another great thing we liked about this diffuser is that it has a huge reservoir, which can contain a maximum of 500mL of water. Thus, even when you are running this diffuser on high mist settings, it will not run out of the water-oil solution quickly. This is great since you don’t have to refill it often. The biggest issue with this model is the confusing instructions. Many of the advertised features such as dimming the light are not intuitive or well-explained in the directions. This can leave customers feeling like the product is not true to form. Lastly, let’s talk about the Everlasting Comfort Diffuser for Essential Oils. This BPA-free oil diffuser has a large tank, as well as simplicity on its side. This is an essential oil diffuser that humidifies as it diffuses. The product has a 400mL tank, so you can run it for continuous hours without having to refill the reservoir. The design of the diffuser is quite modern, so it can fit in with your home design without looking cheap. The light, mist, and timer settings can all be adjusted using three simple buttons on the front of the device, and these are relatively intuitive to use. You can get a very personalized set-up going with this diffuser because it has four-timer options, a variable mist output, and an auto-shutoff feature. Between the lights, you can choose one color, rotate between them all, or have the light completely off. One of the biggest issues with this model is that the power plug has to be inserted on the bottom, so it can be very inconvenient to plug it back in after you have filled up the tank. There are several types of essential oil diffusers on the market, and it can be hard to identify the differences between them if you aren’t familiar with how they work. With our guide, you’ll be able to understand better the terminology that is used when talking about essential oil diffusers so that you can make the right choice about which one is good for you and your home. The first thing that you need to learn more about when it comes to essential oil diffusers is the different types. Generally, the difference lies mostly in how they work. Here are some of the most common types, how they work, and some pros or cons of each type. Ceramic diffusers: This type of diffuser works by dropping a few drops of essential oil onto a ceramic or terra cotta surface, which then disperses the oil into the air. These are great for personal space usage, but they are not suitable for a medium or large room as they don’t disperse the oil enough. Electric diffusers: With this type of diffuser, you add oil to either water or directly onto a diffusing pad. This is then pushed out into the air without heat once the oil is dissolved into microcomponents that can easily mix with the water or air. Cool humidifying oil diffusers fall into this category. These are great for larger spaces and for therapeutic effects, but they are not always the most efficient or economic choices. Ultrasonic diffusers: In a way, ultrasonic diffusers are a sub-category of electric diffusers. They use electricity to vibrate the water and release the water-oil mixture into the air. Some humidifying electric diffusers use ultrasonic methods, and they are great for humidifying dry air. Candle or heat diffusers: Heat diffusers use some type of heating element to help the oil mixture disperse into a whole room more efficiently, so they are great for making a larger space smell great. However, heating essential oils tends to ruin their intended therapeutic effects, so this type of diffuser is better for aroma than it is for health benefits. Nebulizing diffusers: Arguably the most expensive type of diffuser, these diffusers use a glass chamber and a motor to break the oil molecules down into a tiny size that is more easily absorbed. They may have the most significant health benefits, but they are also the loudest and easiest to break. Another critical thing you will want to look at when planning to buy an essential oil diffuser is the water tank size. If the diffuser you choose needs water to function, you will need to fill and replace water regularly. The larger the tank size, the less frequently you will need to fill it up. Another factor that the water tank volume has an impact on is the size of a room that a diffuser can effectively work in. Diffusers that have small water tanks will not be able to work in large rooms effectively, so you’ll want to find something that has a larger tank for those types of rooms. Many modern diffusers have timer settings which allow you to control when a diffuser runs and how much oil they diffuse when they are running. For those who want to strictly control the effects that essential oils have in their home, this is a must. These timer settings come in many varieties. When you are inspecting different diffusers, you’ll want to check out how easy the timer settings are to use, how detailed you can get with them, and whether or not you can easily repeat the same settings. Every diffuser has different mist options. Some only have one setting for the mist dispersion strength that has to be used every time while others have up to 10 different settings that you can switch between depending on the situation you are using the diffuser in. Another thing that you will want to consider about mist is the dispersion range. If you are going to use the diffuser in a large room, you’ll want to make sure that the dispersion range of the mist is fairly wide. If you’ll be using it in a small space, you’ll probably want something more limited. Finally, many diffusers can also be used as a type of light therapy or fun home decoration. Some diffusers have various light modes that you can use to soothe your baby, light your room with a certain color, or just work as a nightlight. For more details about each of those categories, refer to our buyer’s guide above to understand why they are essential and how they differ between diffusers. Each type of diffuser works a little bit differently, but in their essence, all diffusers work by breaking up the essential oils into tiny molecules so that they can be dispersed into the air. Once dispersed, they create appealing aromas. In some cases, essential oils can have positive effects such as promoting relaxation and improving breathing and sleep. An oil diffuser is a device that disperses essential oils into the air using one of a few different dissolving and releasing methods. All of the products reviewed in this article are oil diffusers, and they can be used for their aroma or their health benefits. 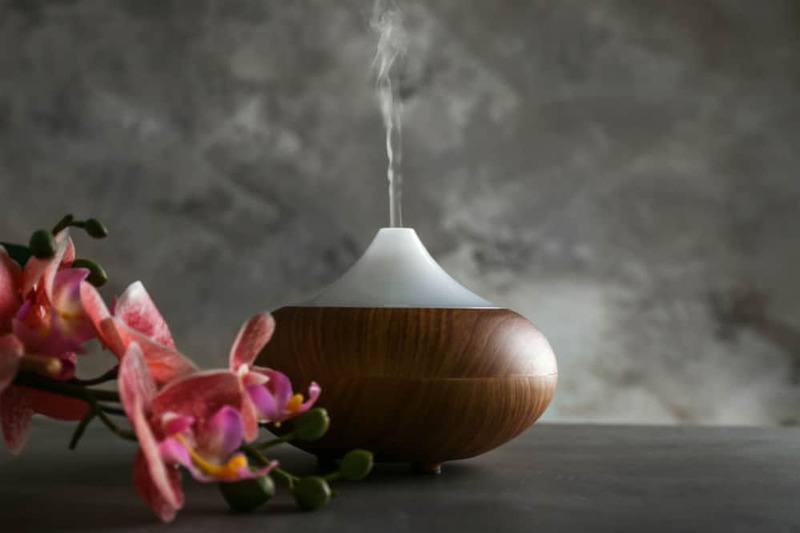 The exact method of using an essential oil diffuser is going to depend on which type of diffuser you have, but we will give you a short description of how to generally make use of essential oil diffusers so that you can have a better understanding. Depending on what you are willing to do, some of these types of diffusers are more likely to appeal to you than others. Choose a location: Find a solid, safe location to place your diffuser. It’s best to choose somewhere away from sunny windows or fans for the best effects. Add water: The most commonly used diffusers need water to function, so you will want to add water. Follow the manufacturer’s instructions strictly to make sure that you add the appropriate amount of water, and do not overfill the device, as this could cause it to malfunction. Add oil: There are many different types of oils that you can use, but make sure that any oil you use is safe for aromatherapy diffusing. Then, mix the appropriate amount according to the manufacturer's instructions. In time, you’ll learn how much you like to add, so feel free to experiment within the device’s recommendations to find your perfect amount of oil. Turn it on: Some diffusers have timers or various settings, so seek help from the manual on how to set them to your desires. We recommend using the standard mode at first and then adjusting the features to fit your needs once you see how it works. Clean the diffuser quickly by rinsing it with water, and then, using natural dish detergent, clean out any build up. Use a bit of vinegar on a cotton swab to wipe down the ultrasonic chip if your device is ultrasonic. Allow it to dry completely before reassembling. To do a deep clean, fill the diffuser halfway with water and add 10 to 15 drops of pure white vinegar. Let the diffuser run for up to 20 minutes, and then wash it out—the vinegar helps loosen oil residue. After which, let it dry completely before you reassemble the device. Those are the most common ways to clean your diffuser, but they are not the only ways. As mentioned, be sure that you consult the manufacturer’s instructions on how to clean your specific diffuser before following either of the two methods mentioned. As you can see, there are quite a few contenders for the position of the best essential oil diffuser of 2018. What really works best for you will ultimately depend on what it is that you are looking for in an essential oil diffuser. That said, we know it can be hard to decide about this because of the massive number of options available. Thus, if we had to choose one essential oil diffuser over all of the others, we would recommend that you try the URPOWER 2nd Version Essential Oil Diffuser. This is a great, reliable entry-level diffuser that will introduce you to many of the most common diffuser features without overwhelming you.